Although, we are still having some chilly days, Spring has officially sprung. My winter blues are finally gone. It is amazing what a difference the spring air does to my mood. I am much more energized these days. Along with the start of this new season, and this new found energy, I am setting some new goals. These goals range from, diet and fitness to house and garden – this Spring there is a lot on my agenda. I am going to begin with my home. My husband and I have owned our 1945 duplex in the DC area for about 3 years now. I have written blog posts about it in the past, but for those who are new to reading this blog, when we moved in we had absolutely no furniture. It sounds a bit weird, but none of the furniture we owned previously was worthy enough to move over to our new place. 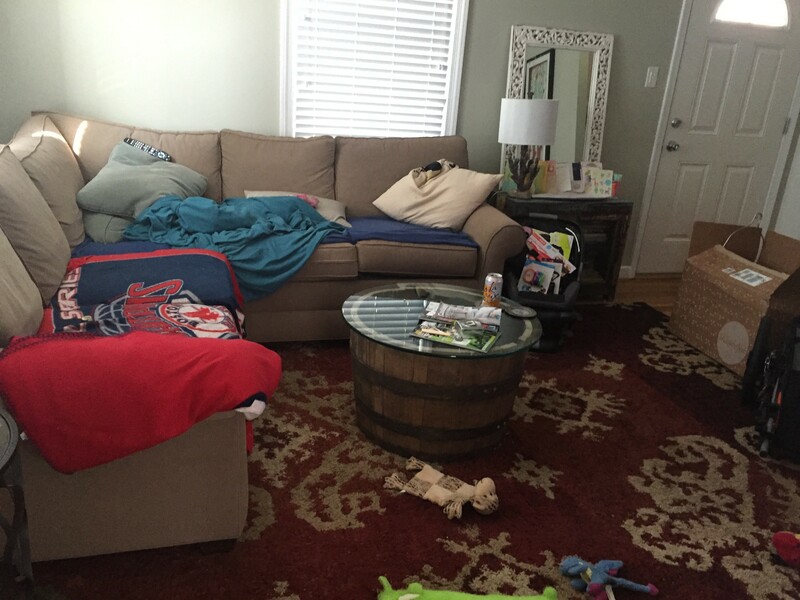 By leaving our old stuff on the curb, it left us with a blank canvas for designing our new home together. I highly recommend this! It is important for couples to move into a place together and build an interior space that really reflects both of them as individuals, but also expresses their identity as a couple. 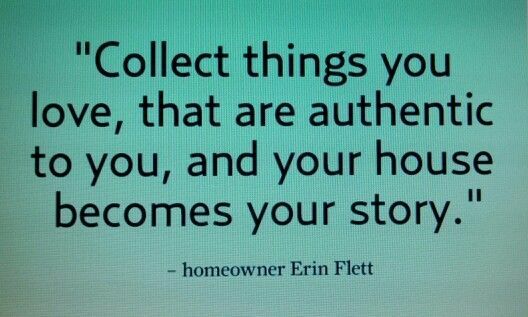 Over the last 3 years, little by little, by collecting things we love, our house has become our home. Having patience is key! Although this is a tip of mine, it definitely was a struggle at first. When moving in I desperately wanted to feel settled. This unsettling feeling can make you take the easy way out, and just buy whatever for the time being, but I didn’t want to waste my money on temporary pieces. I wanted to purchase higher quality furniture, that would last. However, along with higher quality comes a greater expense. I also didn’t want to just fill the space with pieces because I need them, I wanted the right furniture for the space. Older houses have smaller spaces. 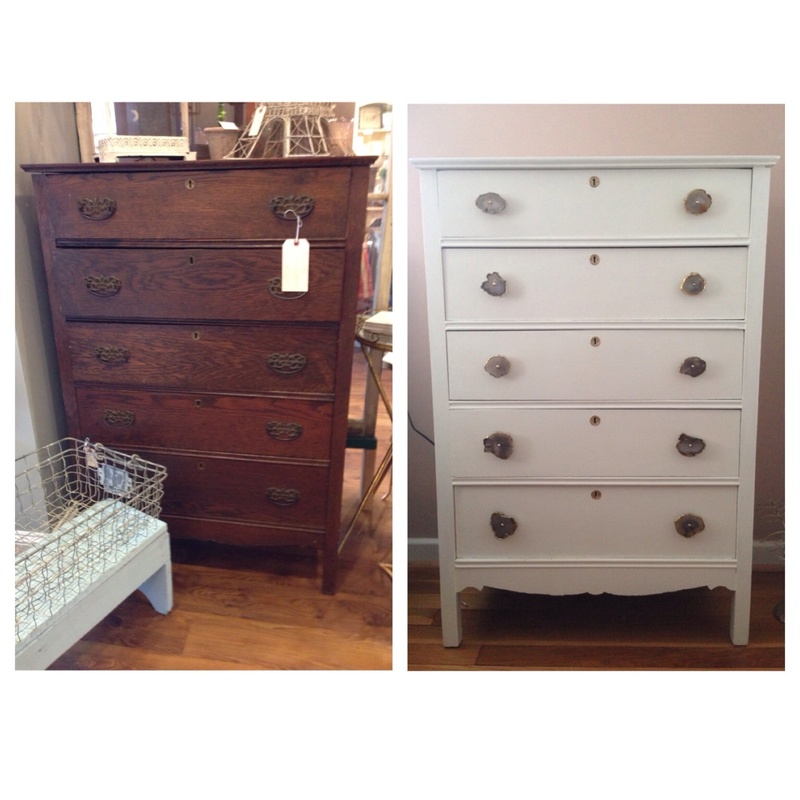 So this put me on an epic hunt, for furniture that had the charm I was looking for, but was small enough. I had to get creative, and have patience, but as time went on, I fount my house filling up. It is a successful mix of new higher quality staple pieces, with vintage finds. This is how we went about it.. The first year we were here, we focused on purchasing some big items, couch, bed, dining room table. 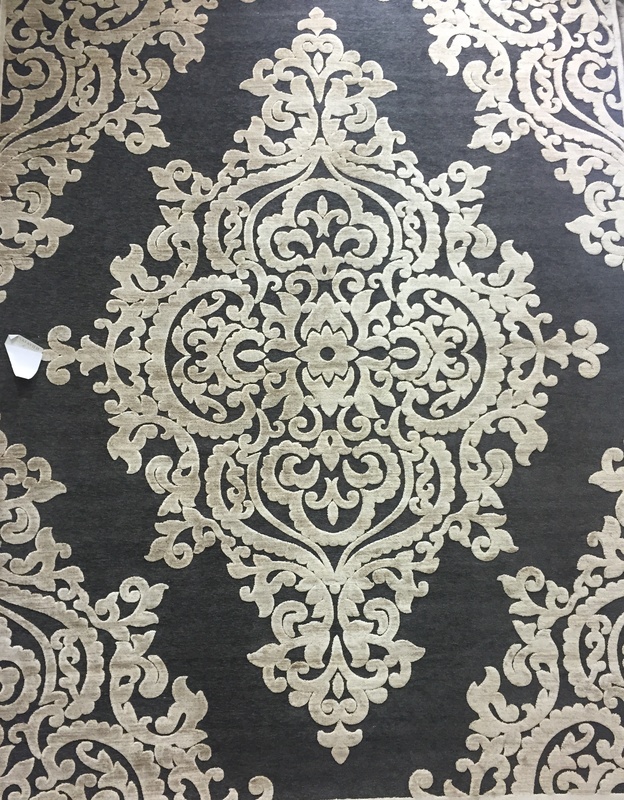 We wanted these items to be high quality pieces that would last. 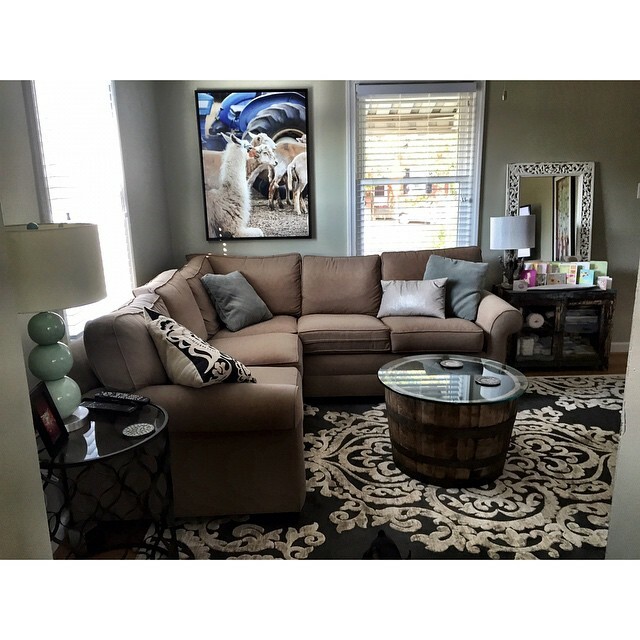 So we spent the money on custom made pieces from Ethan Allen. 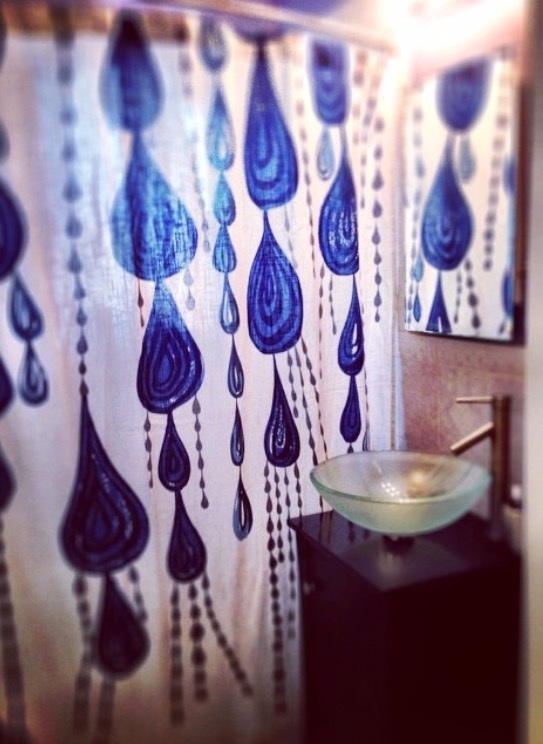 The second year, we focused on accent pieces, such as side tables, lamps, rugs, shower curtain, etc. We also used our front porch to make a peaceful outdoor space. It is there that, we can enjoy a latte while lounging on the wicker love-seat. This last year, I finally purchased some major pieces that I was on a desperate hunt for. My major challenge has been finding furniture to fit such small spaces. Because most USA furniture is larger, I had to get creative. 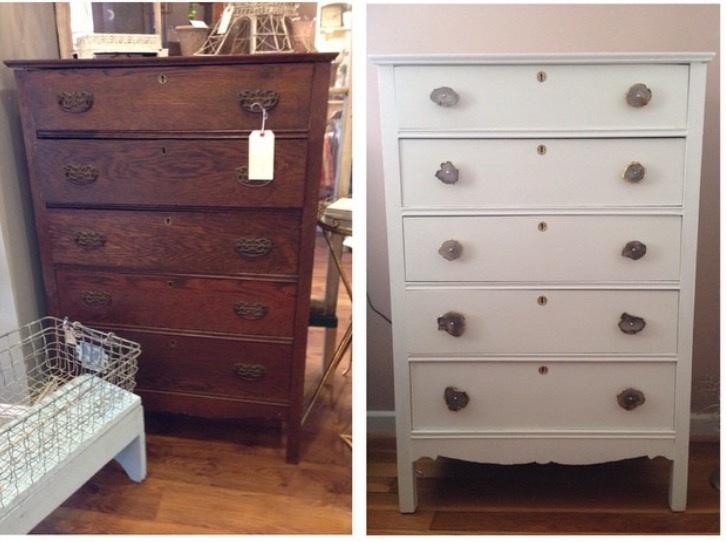 I ended up refinishing an old antique dresser. I finally found a beautiful hutch for my kitchen/dinning room, to store my Vitamix and other kitchen appliances. 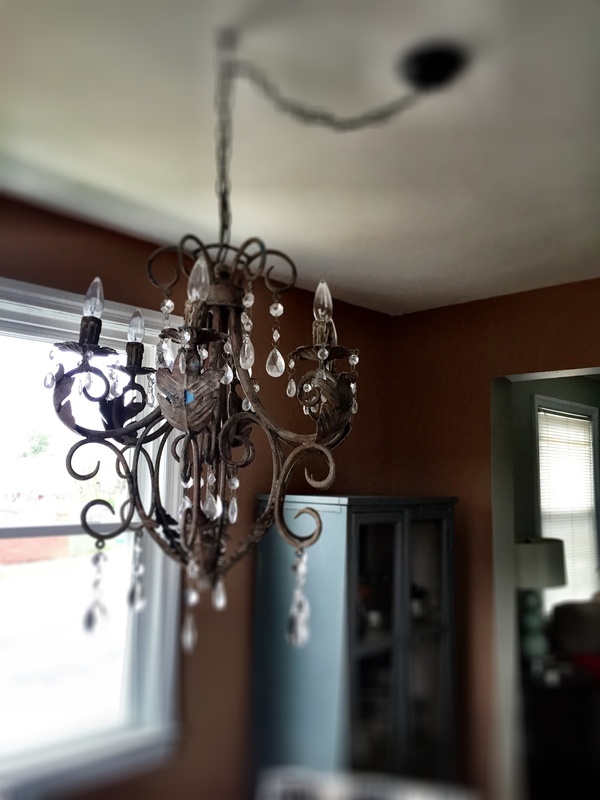 I replaced the ugly old dinning room over-head light with a beautiful rustic chandelier. 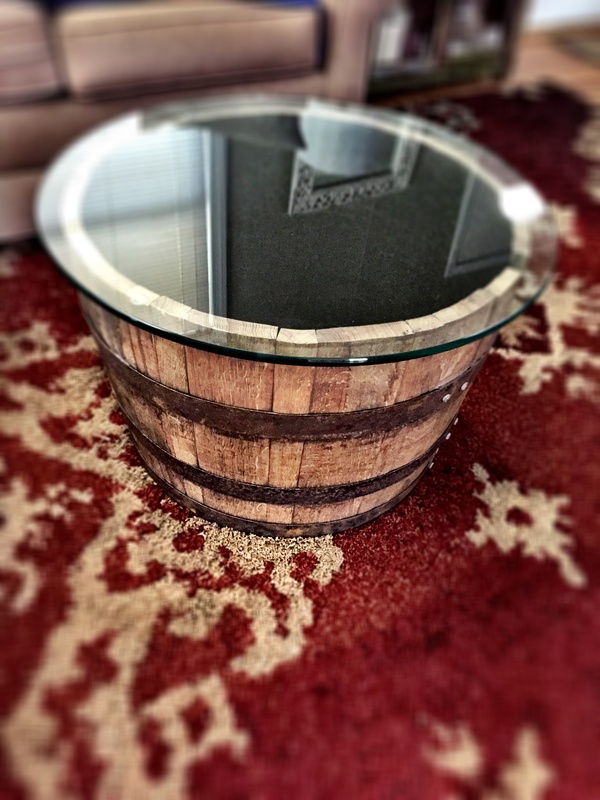 And then, my husband made a coffee table from an old whiskey barrel, that we found in Fredericksburg. 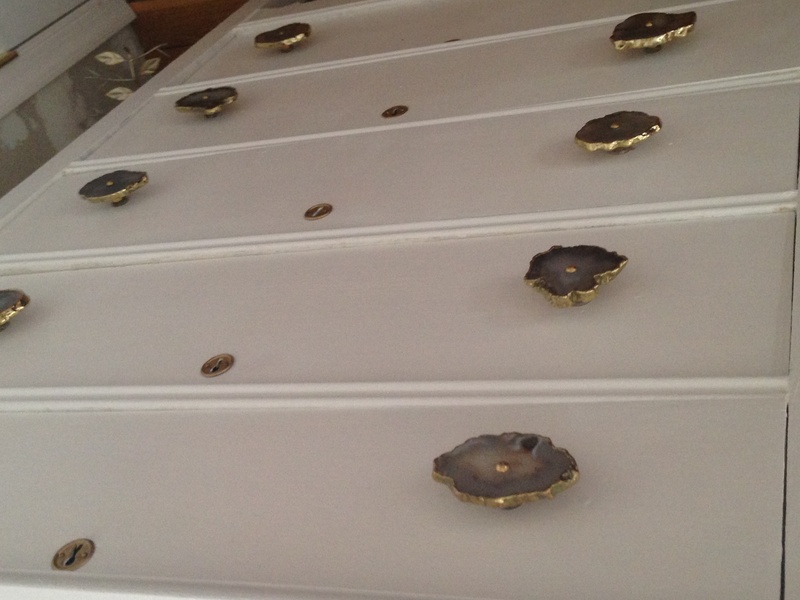 It is the prefect hight, width, and gives us that rustic feel that I love. This spring we have some new house projects to accomplish. Some are fun, others are necessary. 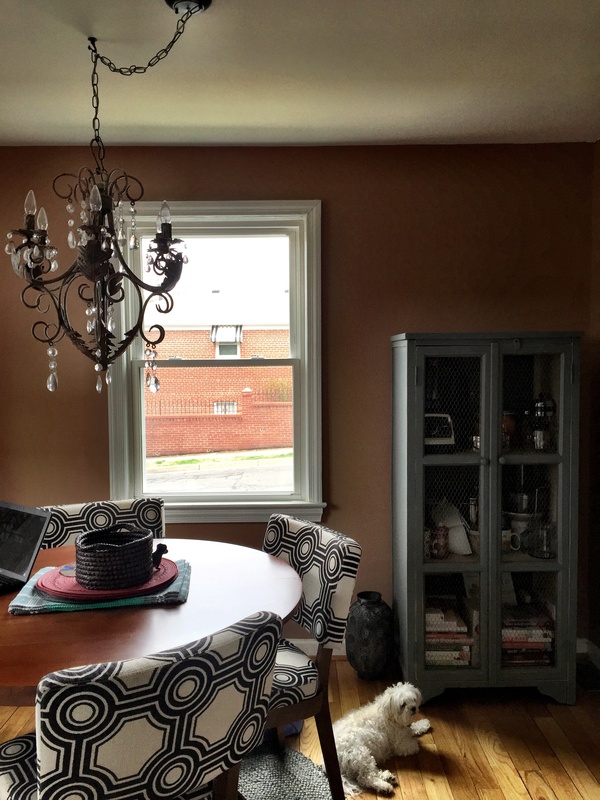 Replace Windows – which we just accomplished on Easter Weekend! They are beautiful! We did our research, and finally in March, we decided on a custom made window replacement. And this Easter weekend, Window Nation came over and completed the project. So one of the necessary house project is now checked off the list. The windows are beautiful and much more energy efficient. Soon we will be picking out blinds or shades. As for the others on the list, we are still coming up with a game plan, but I would have to say one thing I am most excited about is my veggie garden that I will be starting up again this season. I normally do a garden every year, but last year, because of my wedding, it was impossible for me to devote the time to a garden. I missed it so much. This year I can’t wait to watch things grow, and enjoy fresh veggies from my backyard. I also can’t wait to hit up all the local farmer’s markets. I hope you look forward to some gardening posts in the near future. As for diet, like always, my plan is to eat well balance meals that are made up of fresh organic food. Lately, fruit is the number one thing I crave and my refrigerator has been stocked with it. However, fruit taste so much sweeter when it is in season. I am really excited to eat watermelon again, and have tons of fresh fruit to make juices and smoothies. I want to be cooking and grilling up a storm this summer. I am looking forward to trying new recipes and keeping things colorful. Fitness wise, I will admit I have taken it down a notch. When it comes to running, it was too snowy and icy this winter. I look forward to getting some short easy runs in once the weather warms up. But what I have really am getting into is yoga and swimming. I also want to attempt some hiking this season. So those are my future healthy lifestyle goals. Yesterday was 75 degrees. And this week is suppose to continue to stay in the 60s. This weekend, my husband and I are heading down to Del Ray Beach, and South Beach Miami. I can’t wait to soak up some sun, and eat some Cuban food. 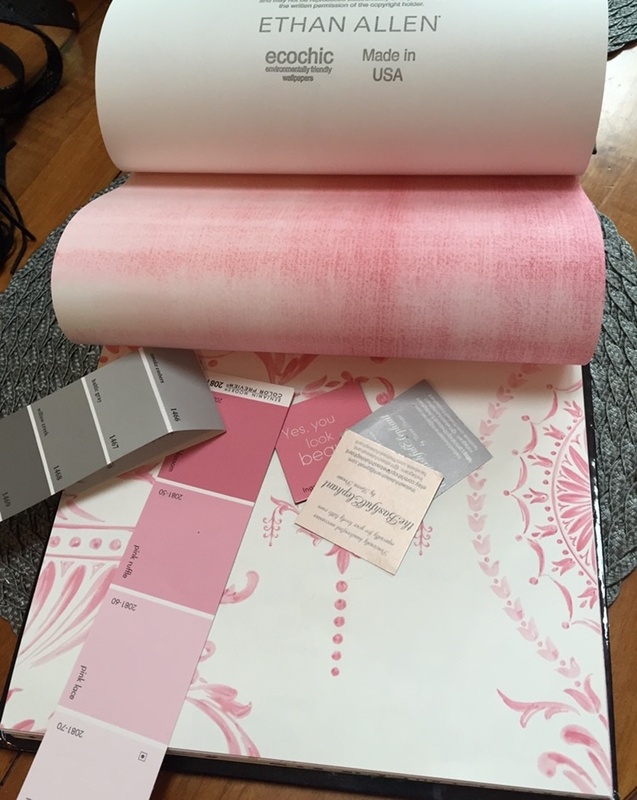 What are some of your home projects? What are your goals for the spring?